The 2015 Interschutz exhibition in Hannover, Germany, was the stage for a powerful demonstration that leading fire suit manufacturer VIKING Life-Saving Equipment (VIKING) is able to listen closely and respond quickly to key firefighter concerns and needs. VIKING Guardian features an outer shell that can easily be removed by the firefighter after attending a fire, leaving the inner liner to be worn during debriefing and the return to base. Before getting into the fire engine, the outer shell is simply placed in a dissolvable washing bag. Detained in the bag, any dangerous particles on the garment surface are effectively cut off from close contact with firefighters and their physical environment during transport, washing, storage and other routine tasks. In May this 2014, a study of Nordic fire fighters reported on cancer diagnoses among 16,422 male fire fighters from the five Nordic countries. Replicating the results of a major US study, the study found increased cancer risk among fire fighters compared with the general population. Since protecting people is at the core of VIKING’s corporate essence, looking for ways to address the cancer issue for the thousands of fire fighters who wear its products was a natural step. 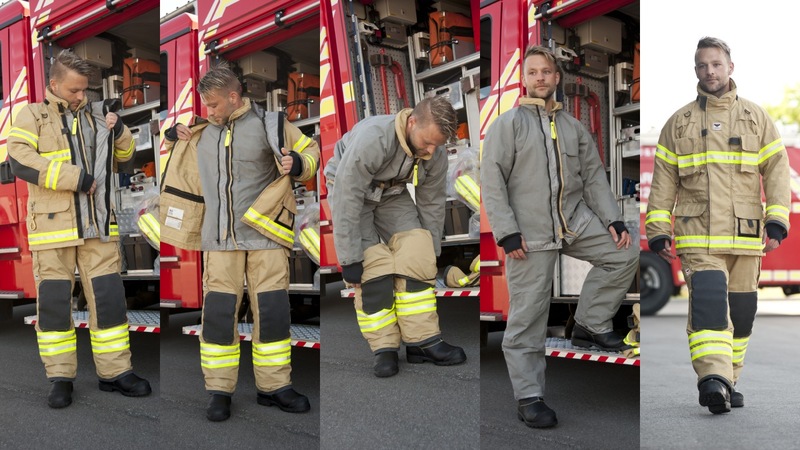 So when Gothenburg (Sweden) based Räddningstjänsten Storgöteborg (RSG), one of Sweden’s most respected and top-performing fire services, invited fire safety equipment manufacturers to help it develop the next generation of fire suits, VIKING didn’t hesitate! Firefighters are potentially exposed to a wide range of known and suspected carcinogens through their work. While factors such as shift work may explain some of the increase in diagnoses, it remains a fact that there is a risk of exposure, for example, to polycyclic aromatic hydrocarbons and asbestos stirred up and spread during a fire. In fact, the increased incidence of cancer, which is described by both studies as moderate, is attracting considerable attention around the world. Under the working title “the Gothenburg suit”, the VIKING Guardian, or PS7200, as it is designated in VIKING’s range of fire suit products – was inspired by the multi-piece VIKING suits worn predominantly outside Europe. However, where those suits are primarily designed to enable easier washing and repair, the VIKING Guardian’s design objectives were far more ambitious. The key idea, introduced by RSG Procurement Manager Katarina Appelqvist, was to create a suit whose outer shell could easily be removed after a firefighting mission, leaving the firefighter wearing the inner layers as perfectly usable clothing, for returning to the station. In this way, a great deal of contact between potentially contaminated garment and the firefighter and could be immediately eliminated while any contamination of interior surfaces on vehicles and fire stations would also be kept to a minimum. In the initial development rounds, RSG worked closely with all the manufacturers, co-developing and testing safety-approved prototypes from each. After crawling, climbing, stress testing and suit removal, fire fighters were asked to rate each prototype on comfort, overall impression and removability of the outer shell. The VIKING prototype convincingly won the test – and a multi-year contract for supply of the new fire suit. Only superior quality materials are used in the VIKING Guardian suit. For the outer shell, firefighters can choose between Hainsworth® TITAN made of the high performing, lightweight DuPont™ Nomex® material well known for durability, inherent protection and the ability to maintain its resilient structure after many washes and VIKING Icon™ made of PBI®, constructed using the highly resistant and thermally stable PBI® fiber from PB® Performance Products. PBI® is also well known for outstanding protection against heat and flames. Both materials are extremely strong and maintain their resilient structure after many washes. On the inside is a CROSSTECH® SR 2 Layer Laminate moisture barrier, which does not lose its high breathability even after exposure to extreme heat, and which, with the outer shell removed, continues to protect the wearer from several types of dangerous fluids and chemicals. Fire fighter comfort received special attention, with features such as pre-bent knees and elbows, a removable hood, and superior, adjustable flexibility to handle many different work situations. The highly durable suit is reinforced with DuPont™ Kevlar® in arms, knees, in the pockets, and at the hem of the pants and the jacket. Attention to detail is evident throughout the design, making it easier, for example, to don communications equipment. General durability was also important. A strategy behind the multi-piece design was the ability to extend the lifetime value of components. Making it possible to purchase a new lining or outer shell rather than discarding the entire suit if only part of it is damaged or worn. VIKING Life-Saving Equipment A/S is a global market leader in maritime and offshore safety, providing and servicing safety and fire-fighting equipment for passenger and cargo ships, offshore installations, fishing vessels, the navy, fire departments and leisure yachts. VIKING is a privately held corporation founded in 1960 with group headquarters in Esbjerg, Denmark. Products are manufactured in Denmark, Norway, Bulgaria and Thailand. VIKING offers a broad range of off-the-shelf and tailored safety solutions and systems certified in accordance with the latest requirements of the IMO, SOLAS, EU and USCG. The product portfolio includes chute and slide-based marine and offshore evacuation and embarkation systems, liferafts, lifejackets, immersion suits, fire suits, work suits, pilot suits, helicopter transportation suits, MOB boats, davits, pilot ladders, signs, and other lifesaving appliances. With 2000 employees worldwide, the unique VIKING network of branch offices, agents, 270 certified servicing stations and worldwide stock points makes VIKING a truly global provider at convenient locations in all significant markets.